Cal here, I’m going to continue exploring dolphin stretch glass – we will look at some of the more interesting and tough to find pieces tonight. 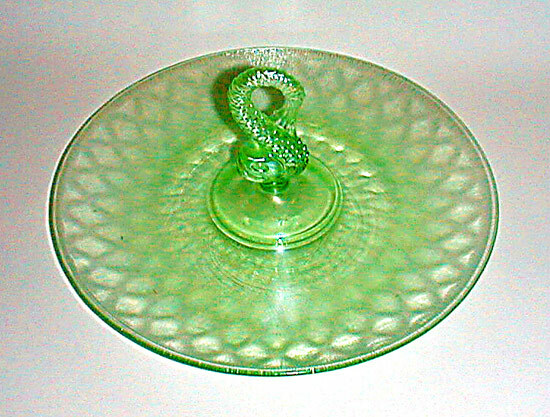 Center-handled butterball and sandwich trays, dolphin-stemmed mint/nut comports, and candleholders are decidedly more difficult to find than other Fenton dolphin stretch glass items. Only limited numbers of these items are known to exist. We know from the challenges Fenton encountered in remaking the dolphin center-handled sandwich trays for the Stretch Glass Society in 1998, it was a difficult item for them to make, in part, because the dolphin center handle is a very thick piece of glass, had to fit into a dolphin-shaped snap, and there are inherent challenges to reshape it into the plate shape and to cool this part of the sandwich tray so that it doesn’t explode. In 1998, when our Wisteria trays were made, only about 50 or 60 of them survived the gradual cooling process of the lehr. 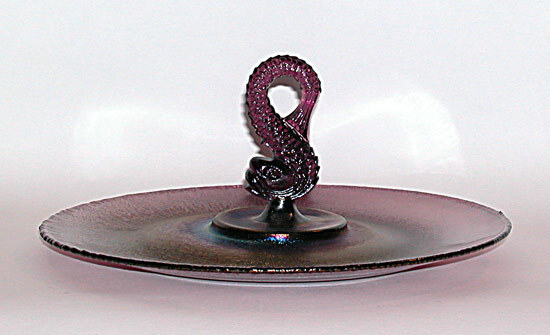 As such, you won’t see many of these newer dolphin-handled trays being offered for sale. 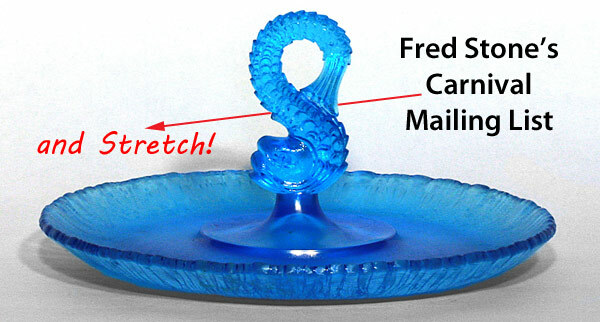 Fenton evidently solved this problem later on as they made an Aqua Opalescent dolphin center-handled tray in sufficient quantity to nearly flood the market. These are available regularly on eBay and I’ve even seen them in antique shows and shops. 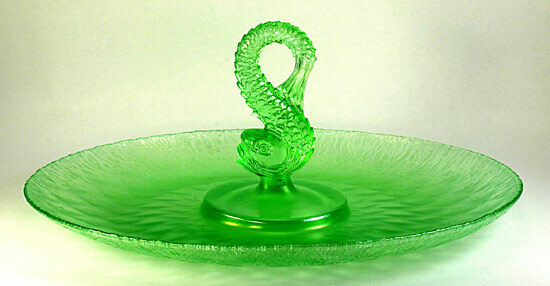 At any rate, vintage center-handled trays of any color or size are available only in limited numbers. Any of these items in any color would be considered a ‘good find’ today. The sandwich trays most often show up with a diamond optic treatment, while the other items do not typically have this treatment. Sandwich trays which do not have the diamond optic treatment are rare. The dolphin mint/nut holders are challenging to find with Florentine Green and Velva Rose ones being considerably more available than the ones in Celeste Blue, of which only a few are known. 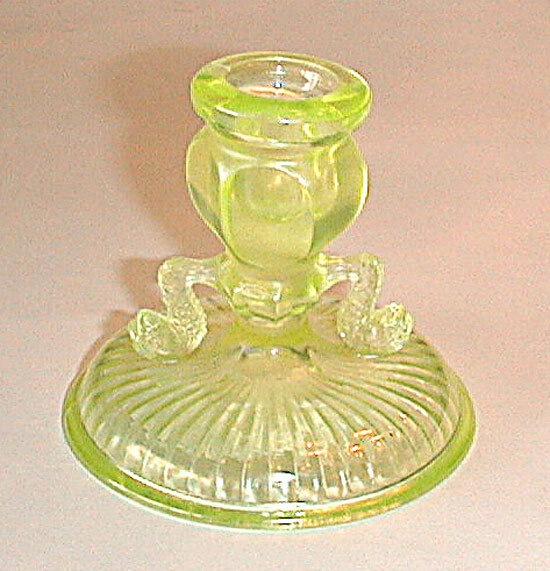 Dolphin candleholders are known in Aquamarine, Florentine Green, Topaz (rare), Velva Rose and Wistaria (scarce). As far as we know, there is only one style and size – they are short candleholders with 2 very ‘bent’ dolphins on either side of the socket. Center-handled butter ball trays are known in Celeste Blue (rare), Florentine Green and Velva Rose. They do not show up in the resale market often, so if you see one, buy it when you see it! We would love to see the dolphin trays and candleholders that you have in your collections, especially if you have one or more which are different from those I’ve discussed here. So, please…haul those dolphins out of your cupboards, snap a quick photo and send them in. Thanks.